Map of Major Cattle Trails.Courtesy of the National Park Service. Image available on the Internet and included in accordance with Title 17 U.S.C. Section 107. Herding Cattle. Courtesy of the Amon Carter Museum of American Art and the Library of Congress. Image available on the Internet and included in accordance with Title 17 U.S.C. Section 107. CATTLE TRAILING. Cattle trailing was the principal method of getting cattle to market in the late nineteenth century. 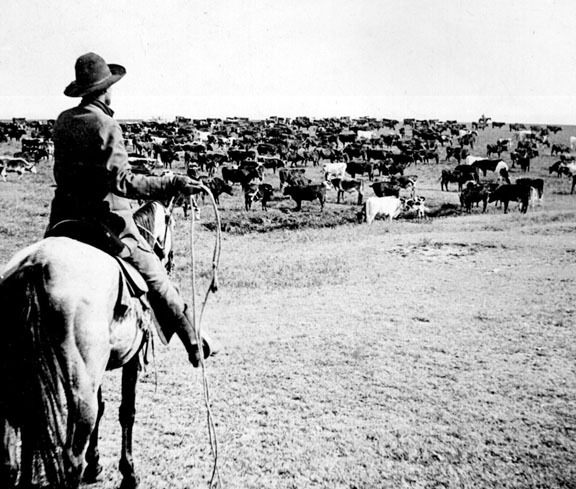 It provided Texans with a practical, economical means of marketing surplus livestock. It also achieved mythological stature as an aspect of the American frontier. Although their heyday was from 1866 to 1890, organized livestock drives to market in the United States date to the seventeenth century, especially in the Carolinas, Massachusetts, New York, and Pennsylvania. Easterners, however, often afoot and aided by shepherd dogs, herded relatively tame animals, whereas Texas drives during the nineteenth century usually featured mounted riders tending decidedly wilder beasts, at first mostly longhorn cattle and usually mavericks. As early as the 1830s, opportunists drove surplus Texas cattle from Stephen F. Austin's colony eastward through treacherous swamp country to New Orleans, where animals fetched twice their Texas market value. After statehood, during the 1840s and 1850s, some cattlemen drove Texas cattle northward over the Shawnee Trail to Illinois, Indiana, Iowa, Missouri, and Ohio, where they were sold mostly to farmers who fattened them for local slaughter markets. The first recorded large cattle drive occurred in 1846, when Edward Piper herded 1,000 head from Texas to Ohio. Outbreaks of "Texas fever" during the mid-1850s caused both Missouri and Kansas legislatures to quarantine their states against "southern cattle." The gold rush to California created substantial demand for slaughter beeves, and during the early to mid-1850s some adventurous Texans herded steers westward through rugged mountains and deserts to West Coast mining camps, where animals worth fourteen dollars in Texas marketed for $100 or more. During the Civil War some Texans drove cattle to New Orleans, where they were sold, but, mostly, animals were left untended at home, where they multiplied. Mavrickers branding mavericks to sell, circa 1880. Courtesy of PBS. Image available on the Internet and included in accordance with Title 17 U.S.C. Section 107. A Cattleman driving his cattle on the Goodnight-Loving Trail. Courtesy of the Historical Society of Quincy and Adams County. Image available on the Internet and included in accordance with Title 17 U.S.C. Section 107. Cattle Fever Sign warning against ticks. Courtesy of Texas A&M University. Image available on the Internet and included in accordance with Title 17 U.S.C. Section 107. At the war's end, Texas possessed between three million and six million head of cattle, many of them wild unbranded mavericks worth locally as little as two dollars each. However, the same beasts were potentially far more valuable elsewhere, especially in the North, which had been largely denuded of its livestock by wartime demand and where longhorns commanded forty dollars or more a head. As early as 1865 a few Texans reportedly tested export markets by trailing cattle to Mexico and Louisiana, but most cattlemen waited until the spring of 1866 to mount large trail drives, especially to the North. That year Texans drove more than 260,000 cattle to assorted markets. Some went eastward to Louisiana, where many animals were shipped by boat to Cairo, Illinois, and St. Louis, Missouri. In search of possible sales among Rocky Mountain miners, veteran cattleman Oliver Loving and his young partner Charles Goodnight that year drove a herd of cattle westward through dangerous Indian country to New Mexico and sold them profitably at Fort Sumner, New Mexico, and at Denver, thereby inaugurating the famed Goodnight-Loving Trail. 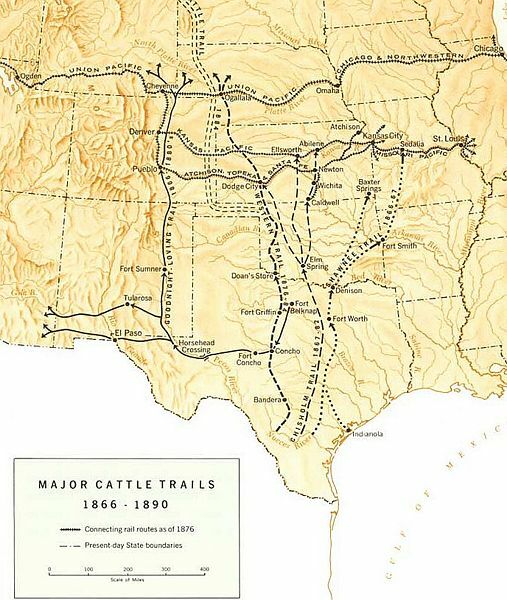 Yet the vast majority of Texans who drove cattle to market in 1866 apparently followed the familiar and safer Shawnee Trail through Indian Territory either to Kansas City or to Sedalia, Missouri, both of which possessed railroad facilities for transshipment eastward, especially to meatpackers at Chicago. While many drovers found profitable markets and sold cattle for as much as sixty dollars a head, others encountered armed, hostile farmers, especially in Missouri, where new outbreaks of Texas fever engendered much anger. Therefore, many cattlemen reportedly resolved not to drive cattle northward again. A number of states, including Colorado, Nebraska, Kansas, Missouri, Illinois, and Kentucky, either barred or severely restricted the trailing of Texas cattle across their borders. The restrictions included fines up to $1,000, and in some areas herds were either impounded or killed. Cattle buyer Joseph G. McCoy. Courtesy of the Kansas Historical Society. Image available on the Internet and included in accordance with Title 17 U.S.C. Section 107. A Sign that reads Welcome to Cleburne on the Chisholm Trail. Courtesy of the Portal to Texas History. Image available on the Internet and included in accordance with Title 17 U.S.C. Section 107. Postwar cattle trailing might have ended had not Illinois cattle buyer Joseph G. McCoy established a marketplace away from settled areas. Selecting Abilene, Kansas, near the center of the mostly uninhabited Great Plains—then a veritable sea of grass—McCoy enticed Kansas Pacific Railroad executives to provide sidings and other facilities and even to pay him a commission on each carload of cattle it shipped from Abilene. He also persuaded Kansas officials not to enforce the state's quarantine law at Abilene in order to attract trail herds; he later successfully lobbied the Illinois legislature to revise its restrictions to allow entry of Texas cattle that had been "wintered" in Kansas, documentation of which soon accompanied every shipment eastward. McCoy advertised his facilities with handbills and by word of mouth, attracting drovers and an estimated 35,000 head of cattle in 1867. Thereafter, until closed to southern cattle by renewed quarantine in 1873, Abilene, Kansas, was the principal railhead-market for Texas cattle. The most important cow path from Texas to Abilene was the Chisholm Trail. Between the Civil War and 1873 more than 1.5 million Texas cattle were driven over it to Abilene, as well as to Wichita and Ellsworth, rival Kansas cattle towns along the trail. John T. Lytle, contract drover. Image available on the Internet and included in accordance with Title 17 U.S.C. Section 107. This enormous traffic gave rise to contract drovers, who, for a fee (usually $1 to $1.50 per head) walked Texas animals to market for their owners, large and small cattle raisers alike who mostly remained at home, tending their breeding stock. Railroad connections with northern and eastern markets, available in Texas after 1873, did not immediately diminish trail traffic because freight rates were two to three times more expensive than drovers' fees. Numerous Texans, mostly young former Confederates, became contract drovers. 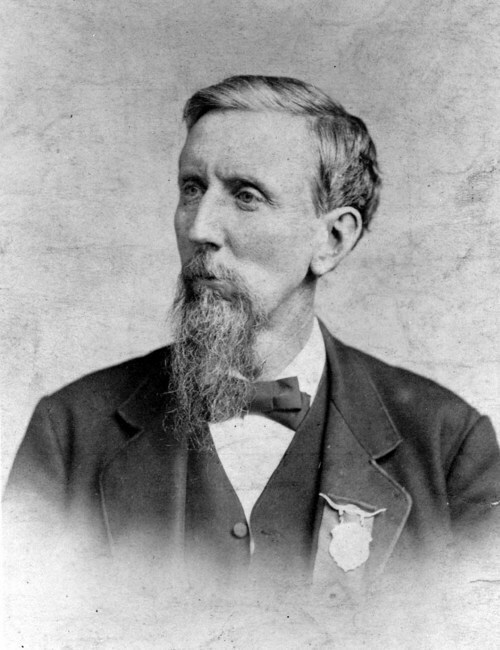 The most active of these was probably John T. Lytle, who, in association with at least three partners between 1871 and 1886, delivered about a half million head of cattle to Kansas markets. Also important were John R. and William B. Blocker, George W. Littlefield, Ike (Isaac Thomas) Pryor, Moses Coggin, Eugene B. Millett, Charles Goodnight, William H. Jennings, and numerous others, most of whom also became substantial ranchers. In addition to contract deliveries, they often included their own livestock on drives, as well as animals they bought cheaply in Texas and drove to market for speculation. However, most of their profits derived from volume and efficient use of manpower. All told, contract drovers accounted for as much as 90 percent of total trail traffic between 1866 and 1890, the rest being moved by those who had actually raised the animals. Early cowboys trailing cattle. Courtesy of the Texas Longhorn Breeders Association. Portal to Texas History. Image available on the Internet and included in accordance with Title 17 U.S.C. Section 107. Texas Cattle Queens. Courtesy of the Austin Chronicle. Image available on the Internet and included in accordance with Title 17 U.S.C. Section 107. Contract Drovers take a break from the Cattle Trail in Deanville. Image available on the Internet and included in accordance with Title 17 U.S.C. Section 107. A herd delivered by contract drovers typically consisted of as many as 3,000 head and employed about eleven persons. An estimated two-thirds of these individuals were whites—"cowboys" mostly, youths aged twelve to eighteen who were readily available for seasonal work as "waddies," as trail hands then were often called. Trail bosses and ramrods—also usually whites—were somewhat older, often in their twenties. The rest were members of minorities—blacks, Hispanics, or Indians—mature men usually, who often served as cooks and as horse wranglers. 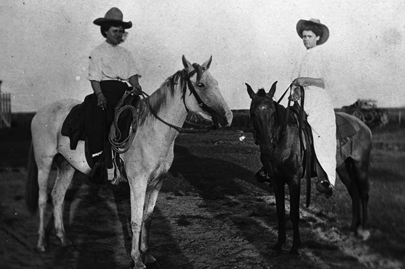 A few adventurous young women rode the trail, frequently disguised as boys. Wages ranged from $25 to $40 a month for waddies, $50 for wranglers, and $75 for cooks and ramrods, to $100 or more for trail bosses, who often also shared the profits. With chuck and equipment wagons leading the way toward suitable campsites, followed closely by horse wranglers and remudas (spare horses), drives were herded by a couple of waddies on "point," two or more on "flank," and two or more on "drag," that dusty rear position often reserved for greenhorns or meted out as punishment to enforce discipline. Little of the work was glamorous. Most days were uneventful; a plodding, leisurely pace of ten to fifteen miles a day allowed cattle to graze their way to market in about six weeks. Drudgery was occasionally punctuated with violent weather, stampedes, dangerous river crossings, and, rarely, hostile Indians. Even so, few trail bosses allowed youthful waddies to carry pistols, which were prone to discharge and stampede cattle. The gun-totin' image of cowboys owes more to Hollywood than to history. A cowboy tends a herd of Longhorns on a spur of the Chisholm Trail near Deanville. Image available on the Internet and included in accordance with Title 17 U.S.C. Section 107. Painting, men herding cattle on the Great Western Trail, 1890s. Courtesy of Barbara Vaupel and the Oklahoma State Senate Historical Preservation Fund. Image available on the Internet and included in accordance with Title 17 U.S.C. Section 107. A cowboy puts up barbed wire around a cattle pen. Courtesy of the Portal to Texas History. Image available on the Internet and included in accordance with Title 17 U.S.C. Section 107. By about 1876 most northern cattle drives shifted westward from the Texas Road (or Chisholm Trail) to the Great Western (Dodge City or Ogallala) Trail. By then much of the eastern trail in Texas traversed settled country, and farmers strenuously objected to cattle being driven through their fields. Civilized tribes in Indian Territory increasingly demanded grazing fees from the drovers who crossed their reservations. 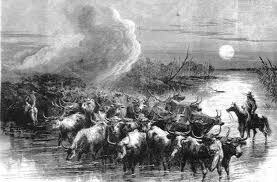 And, after 1873, Texas herds capable of carrying Texas fever were quarantined from Abilene, Ellsworth, and Wichita, forcing drovers who continued to use the Chisholm Trail westward to Hays. Looking for an alternate route and market, in 1874 contract drover John Lytle blazed the Great Western Trail to Dodge City, but few of his contemporaries immediately followed his path. Most of them waited until Comanche and Kiowas Indians had been disarmed and forced onto reservations after the Red River War (1871–76). Thereafter, until Kansas and other northern states and territories totally quarantined themselves against Texas fever in 1885, the trail to Dodge was the principal thoroughfare over which between 2.7 million and 6 million Texas cattle were moved to market. To forestall the end of trailing, contract drovers and South Texas cattlemen sought to circumvent quarantines by asking Congress to establish a National Trail, a federal highway for cattle that would have departed the Great Western Trail south of the Kansas border, run westward through the Oklahoma Panhandle, and then turned northward to pass through Colorado, Nebraska, Wyoming, and Montana, ending at the international boundary. But the bill died in the House of Representatives. By then the Great Western Trail had been blocked in innumerable places with barbed wire fences, legally erected and not, both in Texas and north of the Red River. With the movement of cattle thus greatly impeded by quarantines and barbed wire, Texas cattlemen increasingly shifted to railroads to transport their animals to market. Edward Everett Dale, The Range Cattle Industry (Norman: University of Oklahoma Press, 1930). Wayne Gard, The Chisholm Trail; with Drawings by Nick Eggenhofer (Norman: University of Oklahoma Press, 1954). J. Evetts Haley, "Texas Fever and the Winchester Quarantine," Panhandle-Plains Historical Review 8 (1935). J. Marvin Hunter, Trail Drivers of Texas (2 vols., San Antonio: Jackson Printing, 1920, 1923; 4th ed., Austin: University of Texas Press, 1985). Terry G. Jordan, Trails to Texas: Southern Roots of Western Cattle Ranching (Lincoln: University of Nebraska Press, 1981). Joseph G. McCoy, Historic Sketches of the Cattle Trade of the West and Southwest (Kansas City, Missouri: Ramsey, Millett, and Hudson, 1874; rpt., Philadelphia: Porcupine, 1974). Joseph Nimmo, Jr., Report in Regard to the Range and Cattle Business of the United States (Washington: GPO, 1885; rpt., New York: Arno Press, 1972). Jimmy M. Skaggs, The Cattle-Trailing Industry: Between Supply and Demand, 1866–1890 (Lawrence: University Press of Kansas, 1973). Jimmy M. Skaggs, Prime Cut: Livestock Raising and Meatpacking in the United States, 1607–1983 (College Station: Texas A&M University Press, 1986). Jack Weston, The Real American Cowboy (New York: Schocken Books, 1985). 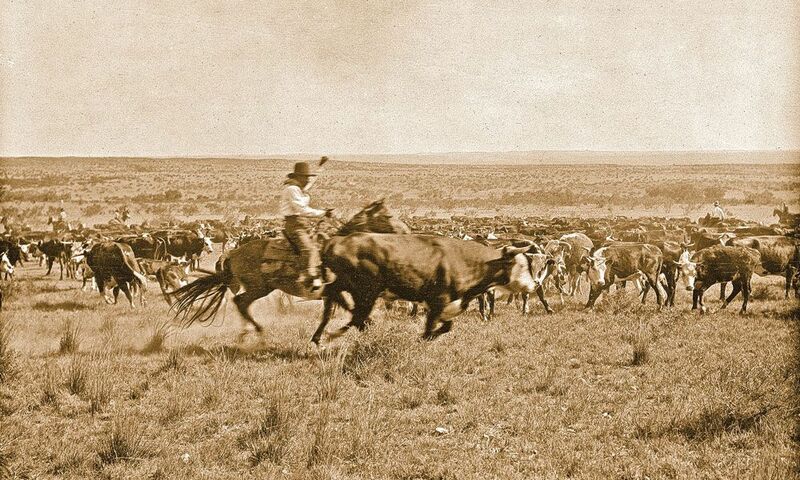 Handbook of Texas Online, Jimmy M. Skaggs, "CATTLE TRAILING," accessed April 24, 2019, http://www.tshaonline.org/handbook/online/articles/ayc01. Uploaded on June 12, 2010. Modified on June 5, 2017. Published by the Texas State Historical Association.